More than 28 million baby boomers will develop Alzheimer’s disease between now and midcentury, and the cost of caring for them will consume nearly 25 percent of Medicare spending in 2040, according to new research reported by the Alzheimer’s Association. In 2015, Alzheimer’s and other dementias will cost the nation $226 billion. By 2050, these costs could rise as high as $1.1 trillion—that’s almost double our current national defense budget. If something isn’t done to effect a change, the costs of this disease on America are simply mind boggling. And the toll on America’s families is far more taxing. Caregivers of these patients are under such physical and mental stress that they had $9.7 billion in additional health care costs of their own in 2014. The disease, which starts out mild and gets progressively worse, is a neurological disorder in which the death of brain cells causes memory loss and cognitive decline. It kills more people than breast and prostate cancer combined and it’s on the rise. What is so ruthless about this disease for caregivers is the nature of the progression. Their loved ones fail to recognize them long before their bodies give way to the disease. Out of the top 10 causes of death in the United States, Alzheimer’s disease is the only one that can’t be prevented, slowed or cured. More than 5 million people have Alzheimer’s disease today. As baby boomers continue to age, that figure is expected to nearly triple. Because of the demographics, pharmaceutical companies like Eli Lilly are researching drugs that could have an effect on the disease, but more research is required and more studies need to be conducted in order to make real headway towards tactics that may help prevent or slow the disease. In 2011, Congress passed the Alzheimer’s Accountability Act, which directs the National Institutes of Health (NIH) to submit a Professional Judgment Budget to Congress every fiscal year until 2025, making it a medical priority for the country. “But while dementia is about to become the biggest caregiving challenge of our generation, funding to battle the disease has not kept pace,” writes CNN’s Sanjay Gupta In FY 2015 Alzheimer's research was given a mere $631 million in funding from the NIH in fiscal year 2015, while cancer got more than $5 billion, AIDS $3 billion and cardiovascular disease nearly $2 billion. In a report issued this summer, the Alzheimer's Association stated that it will take a $2 billion a year investment by the government to change the trajectory of the disease. 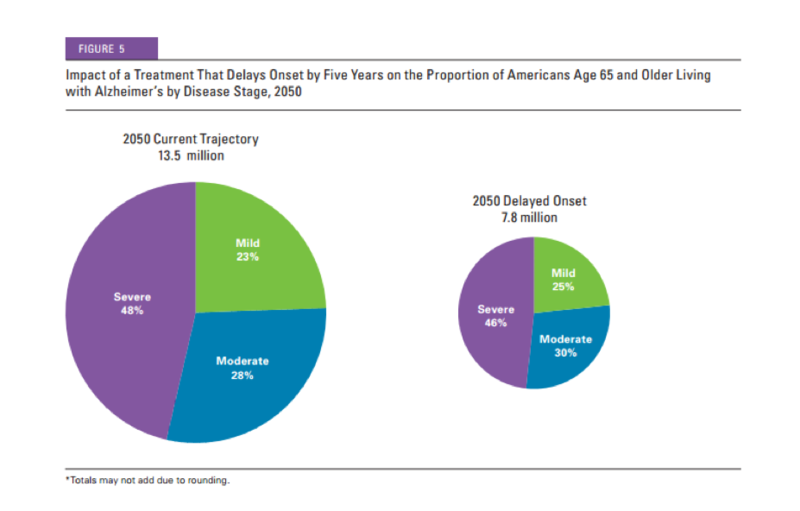 By realizing a treatment in 2025 that would delay the onset of the disease by five years, the proportion of Americans fighting the disease drops considerably. See the chart below. The savings gained for Medicare, Medicaid and out of pocket spending are outlined in the study in detail and total millions. The research investment would be recovered in just three years. 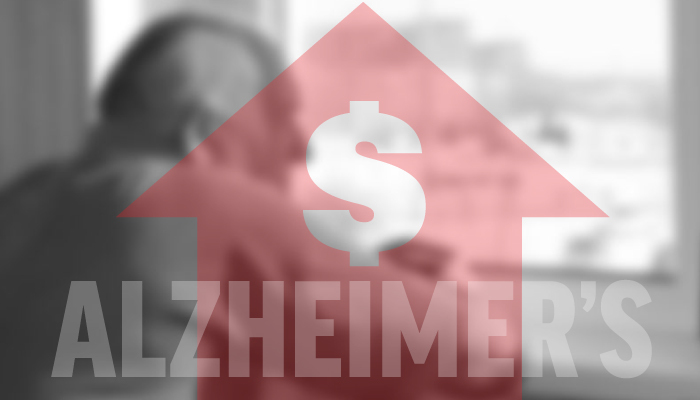 The NIH has announced estimated spending for Alzheimer’s to be around $1 billion for FY16. While it is an increase, it’s still shy of past investments made for cancer and HIV/AIDS. Alzheimer’s and dementia will have a grave impact on health care costs moving forward and Medicare/Medicaid budgets will hang in the balance if the current trajectory of the disease isn’t altered. With the returns on research predicted to be so high and benefits to families even more impactful, why wouldn’t we target this disease for destruction next?